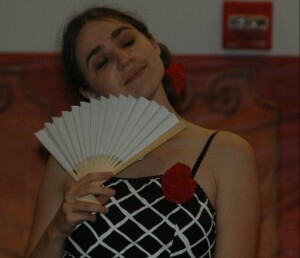 Myrna Meeroff in the role of Carmen in an Interactive Opera performance. Myrna Meeroff, horn, has been a South Florida resident for most of her life. Born in Buenos Aires, Argentina, Ms. Meeroff is an avid soloist, orchestral musician, and music educator. She is the 2002 winner of the Rising Star International Solo Competition and has performed as a soloist all over the world. 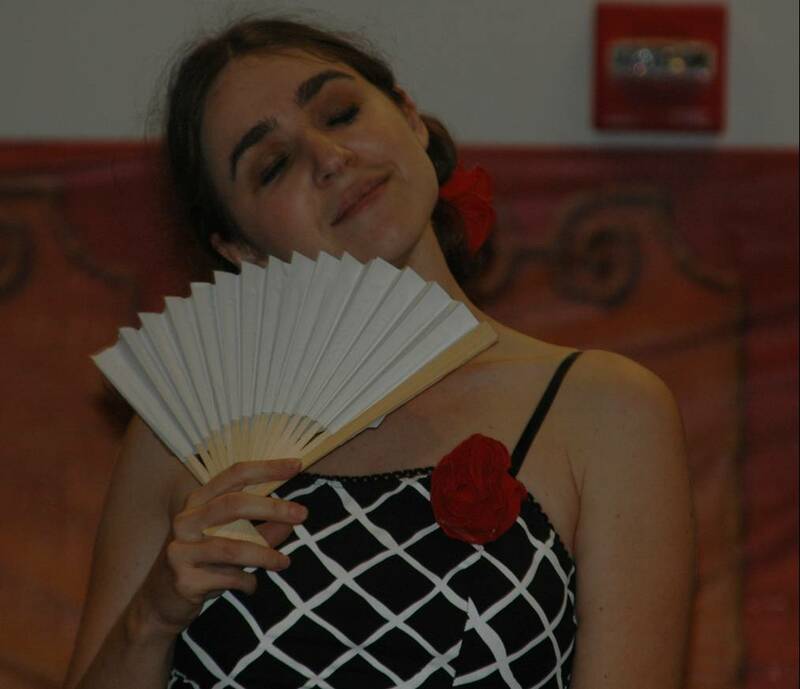 Currently she is on the faculty at Broward College and a teaching artist for VSA Florida. Ms. Meeroff is also part of the Arts in Education Directory of Broward and is a five time finalist for Teaching Artist of the Year. Ms. Meeroff is a graduate of the University of Miami and Florida Atlantic University. 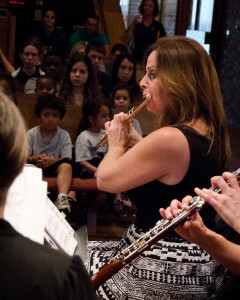 Marie Stile Schwartz, Flute, is currently the Principal Flutist of the South Florida Chamber Ensemble, the Principal Piccoloist of The South Florida Flute Orchestra, and the Piccoloist/2nd Flutist of the CVE Orchestra. She was the Principal Flutist of the South Shore Symphony for 18 years, where she performed multiple concerti as a piccolo and flute soloist at the invitation of each of its conductors. She was also the Winner of her University’s Concerto competition. Marie has performed with internationally acclaimed musicians including Sir James and Lady Galway, Jean­-Pierre Rampal, and Chicago (the rock band), and with Florida’s top orchestras including the Boca Symphonia, The Philharmonia, and the Palm Beach Orchestra. 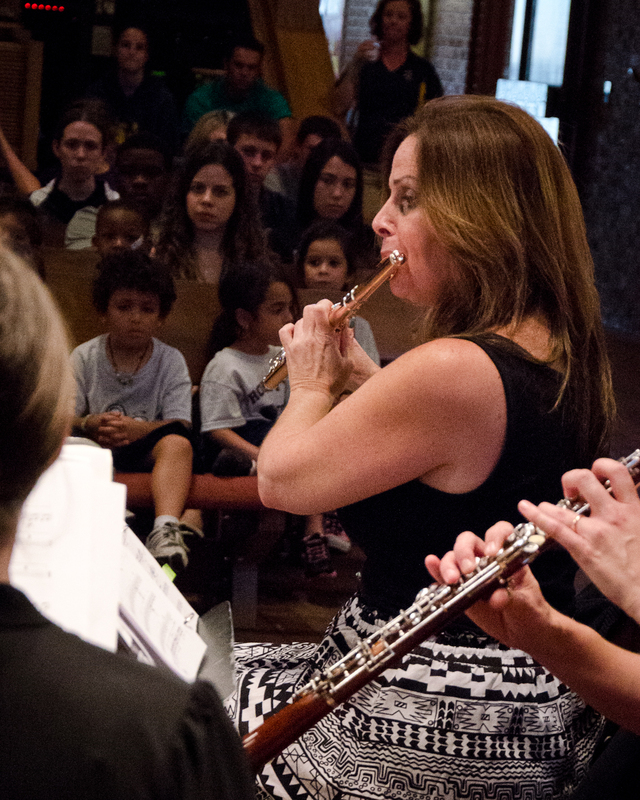 Venues include the State Capitol, Mizner Park Amphitheater (as a flutist in the Boca Festival of the Arts and as a Conductor with the FYO), the Florida National and State flute conventions, and TV and NPR radio, as well. As Principal Flutist of her NY woodwind quintet, 4 Winds & A Horn, she made lifetime alliances with composers, who wrote compositions for her quintet and for her as a flute concerto soloist. Marie was the co-­creator of YMIP (Young Musicians in Performance) Concerto Competition, which was featured on WQXR’s radio station. She was the former Conductor and creator of the Florida Youth Orchestra (FYO)’s Flute Orchestra for 7 years. Marie follows her passion of extending classical music to youth by maintaining an active private studio. Her students and children continue to claim prestigious achievements and performance opportunities in the musical world. 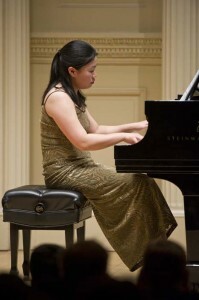 Ms. Kuan has obtained awards at competitions worldwide, including the 13th Beethoven Piano Competition in Vienna (Best Female Pianist Award, 2009), the 12th Taipei Chopin International Piano Competition (3rd Prize, 2008), Corpus Christi International Competition in Texas (2nd Prize, 2008), New York Kosciuszko Chopin Piano Competition (3rd Prize, 2003), and BYU-Hawaii Concerto Competition (Winner, 2000). She is currently serving as the collaborative pianist at Lynn University. Ms. Kuan holds degrees from the Yale School of Music and the Manhattan School of Music. 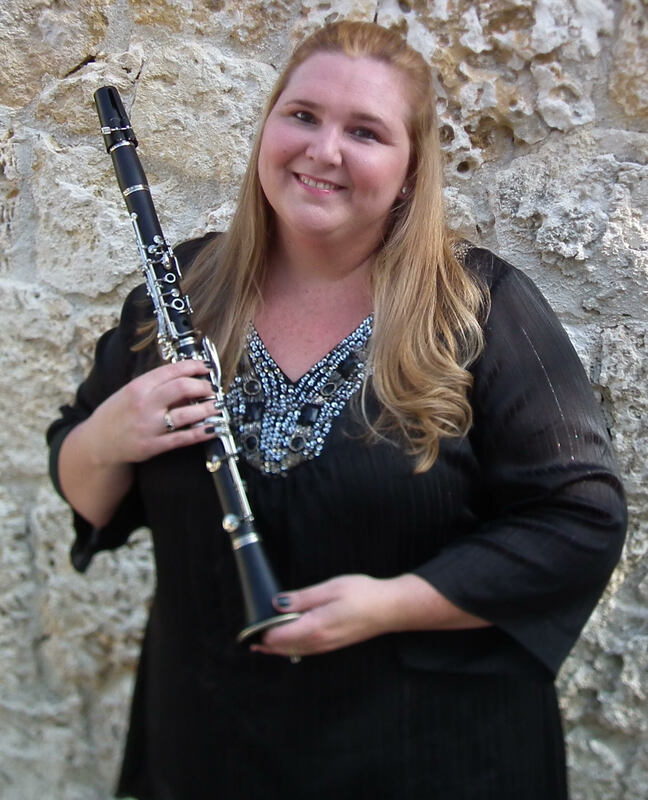 Christine Pascual-Fernandez, clarinet, earned her Bachelor of Music degree in Music Performance from Florida State University and currently serves as Principal Clarinet for the Miami Lyric Opera, Miami Wind Symphony, Greater Miami Symphonic Band and clarinet coach for the South Florida Youth Symphony. She has also performed with the Symphony of the Americas, Orchestra Miami, Southwest Florida Symphony Orchestra, Palm Beach Symphony, South Florida Philharmonic Orchestra, Hallandale Symphonic Pops, Sugar Pops Orchestra and Alhambra Orchestra. Michael A. Harris, pianist, received his early musical training in Brooklyn, New York at the Brooklyn College Preparatory Center for the Performing Arts, under the instruction of Victoria Freyberg. Awards included being named 1st place winner of the BACA competition in New York City, with winners’ recital at Carnegie Hall, and Finalist in the Young Keyboard Artist Competition in Ann Arbor, Michigan. Mr. Harris continued his piano studies at the University of Southwest Florida School of Music, in Tampa, Florida, with Joseph Schwartz, where he earned the Bachelor of Music Degree in Classical Piano Performance. While there in 1999, he made his debut with the Florida Orchestra at the Tampa Bay Performing Arts Center. Mr. Harris was featured soloist in the Orchestra’s “Kids’ Playtime Concert Series” in their presentation of Camille Saint-Saen’s “Carnival of the Animals”. He was also winner of the University of South Florida 2001 Concerto Competition, performing the Franz Liszt Piano Concerto in E- flat major at the winners’ recital. In 2001, while working on the Master of Music Degree in Classical Piano Performance, under the direction of Dr. Miguel Salvador, Mr. Harris was named winner of the Florida International University Annual Concerto Competition. Since then, Mr. Harris has given numerous solo piano recitals and has participated in several musical collaborations throughout Southwest, Florida, New York, Maryland, Washington D.C., and San Francisco.